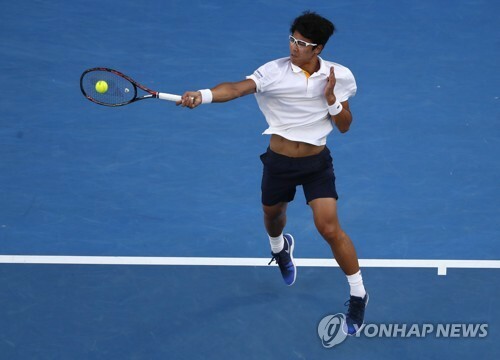 SEOUL, Jan. 22 (Yonhap) — Chung Hyeon continued his impressive run at the Australian Open on Monday after he beat former world No. 1 Novak Djokovic to become the first South Korean to reach the last eight at a Grand Slam event. Chung produced another upset at the Australian Open after he knocked out Djokovic 3-0 (7-6 (7-4), 7-5, 7-6 (7-3)) in the round of 16 contest at Rod Laver Arena in Melbourne. He reached the last 16 at the season’s first grand slam event with a surprising win over world No. 4 Alexander Zverev on Saturday. Chung will next face 97th-ranked Tennys Sandgren of the U.S., who also had an upset win against fifth-seeded Dominic Thiem of Austria, in the quarterfinal. Chung is now the first South Korean tennis player to reach the last eight at a Grand Slam tournament. Previously, Lee Duk-hee in the women’s singles at the 1981 U.S Open and Lee Hyun-taik in the men’s singles at the 2000 and 2007 U.S. Opens had reached the round of 16.